The fact that it has been built in the middle of a huge network of fields, which have not all been used up yet, has allowed it to keep on expanding, with new shops and entertainment areas springing up once every few months. There is truly something for everyone here, but right now I’m just going to narrow it down to 10 reasons why it’s cool to take the kids here. If you can think of any other reasons, do let me know. 1. Detsky Koutek Letnanek - if you prefer to do your shopping sans the kids, then this light, airy and spacious, supervised Indoor Playgroundwill keep them entertained for ages (open every day from 10am-9pm). Suitable for kids from 3 to 12 years of age. Daily activities are organized at around 3pm. 2. Fontana Food Court - with a great choice of cheap and tasty Chinese dishes that are cooked right in front of you. The food court also offers Indian, Czech, Italian, sushi and freshly made sandwiches. There is also a small kids’ playing area with a ball pool, mini slide and TV. 3. Aquacentrum Lagoon Swimming Centre - is at the rear of the main entrance to TESCO’s (5 minute walk from Indoor Playground Letnanek). What a great place to rest your weary bones after all that shopping and to tire the kids out. There is a small wading pool, an-86m long water slide, warm whirl-pools and even a trampoline, if you prefer to stay dry. There is also a mini-spa and fitness centre. Birthday parties can be held at the pool – provided that your kids know how to swim. Separate parking is available directly in front of the pool building. (Tel: 283 921 799 or http://www.letnanylagoon.cz). 4. 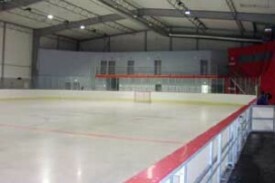 Ice Arena - A great place for all-year-round public ice-skating. There are 2 rinks, always open to the public on weekends from 10-12pm, then 2-4pm and 8-10pm. Skates are available for hire. The Ice Arena is located to the right of the Aquacentrum Lagoon Swimming Centre, which is a 5-minute walk from the Indoor Playground Letnanek. More info on: tel: 286 920 035 or www.icearena.cz (in Czech only). 5. Token-operated rides – Kids up to the age of 6 will love going on these rides over and over (mine certainly do). There is a choice of 6 attractions. Each token costs 10 CZK and the happy tree exchanging coins for tokens also accepts notes up to the value of 200 CZK. While the kids ride you can enjoy a cappuccino at the adjacent café and still be able to keep an eye on them. 7. Outdoor Playground - If the kids get too restless indoors (and weather permitting), take them out for a little run around in the playground. It can best be accessed from KIKA furniture store or by turning left at the first exit from Indoor Playground Letnanek. It is right across from the bus stop which links the shopping mall with Letnany Metro station. 8. Hairdresser’s Klier - if your kids need a haircut, then this hairdressers (opposite TESCO),will do it at around 250 CZK and the small car chair for the young clientele, will make the whole cutting experience a little more tolerable for all. They do not take any appointments in advance, so you just show up and get served on the spot (or come back later when they are free). 9. Clothes & Toys - you can get your kids dressed and well-heeled with a wide choice of stores selling kids’ clothesincluding: Mothercare, Zara, H&M, Next, C&A and Kenvelo Kids. Kids’ shoes are available at Humanic, Bata, Deichmann and RENO. After ‘torturing’ them with shoes and clothes, rewards for good behaviour can be found at either Sparky’s toys, Puntanela or at the hobby store right opposite TESCO selling masses of trucks, cars, cranes, tractors and many other temptations for little boys. 10. KIKA Furniture Store - has a nifty (unsupervised) kids’ play are inside its restaurant on the 2nd level. Tel: 241 089 211 or www.kika.cz (in Czech only). So bring your partner, bring your kids and bring your wallet to OC Letnany! DIRECTIONS: By Metro: Red Line C get off at Letnany and then use the free Shopping Centre Letnany bus which leaves every 5 minutes and takes 5 minutes to reach the Shopping Centre stopping at the back entrance of KIKA furniture store.